Blessed art Thou O Christ our God / Who hast revealed the fishermen as most wise, / by sending down upon them the Holy Spirit. / Through them Thou didst draw the world into Thy net, // O Lover of man, glory to Thee. When the Most High came down and confused the tongues / He divided the nations; / but when He distributed the tongues of fire, He called all to unity. / Therefore, with one voice, we glorify the All-Holy Spirit. ➢ Please help by donating towards the purchase of air condition units for the church! “Introduction to Orthodoxy” class on Wednesday, following Vespers. Liturgy for Ss. Peter and Paul on Saturday, 8.00 AM. Williams Baptism on Saturday, 4.00 PM. Then, having reached this climax, we are invited to kneel. This is our first kneeling since Pascha. It signifies that after these fifty days of Paschal joy and fulness, of experiencing the Kingdom of God, the Church now is about to begin her pilgrimage through time and history. 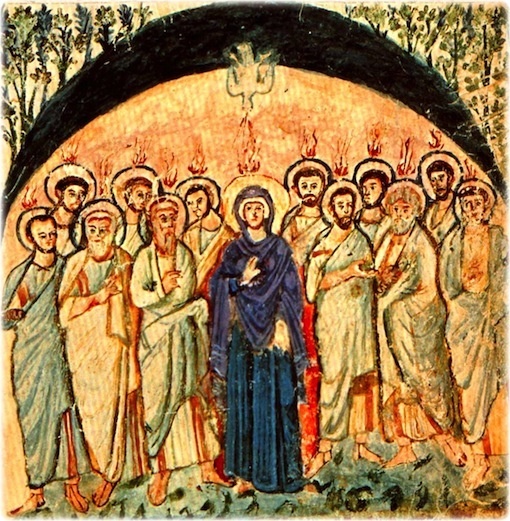 It is evening again, and the night approaches, during which temptations and failures await us, when, more than anything else, we need Divine help, that presence and power of the Holy Spirit, who has already revealed to us the joyful End, who now will help us in our effort towards fulfillment and salvation. The joy of Pascha has been completed and we again have to wait for the dawn of the Eternal Day. Yet, knowing our weakness, humbling ourselves by kneeling, we also know the joy and the power of the Holy Spirit who has come. We know that God is with us, that in Him is our victory. Our good name is very important for us in life. “A good name is rather to be chosen than great riches”, says the wise Solomon (Prov. 22:1). So what should we do when other people deprive us of our good name? First of all, no matter how bad and how injurious the evil talk spread about us may be, we must guard ourselves from anger, verbal abuse, and revenge, but remain as placid as possible in spirit, because we all must be of one spirit with Christ, and Christ, in the face of all accusations, remained in a placid, not in the least bit vengeful, spirit. Christ, “when he was reviled, reviled not again…”, the holy Apostle Peter says (1 Pet. 2:23). When you hear that others are speaking badly of you and ascribing to you vices of various sorts, bad intentions, and so forth, then immediately subject yourself to the strictest examination to see whether the vices they ascribe to you are really there…. Examine yourself very closely: don’t those vices actually lurk within you, if only to a small degree? Isn’t there pride, falsehood, and so on? Other people’s eyes often see our conduct much better and more reliably than our own do, because every person has a certain amount of pride, and pride always conceals us from ourselves. Thus, we can rarely see ourselves accurately… If impartial examination of yourself shows you that others reproach you even the least bit justly, then quickly offer repentance, fervently pray to the Lord God to deliver you from that vice, try zealously to correct yourself of it, and then everywhere show the utmost sincere friendly disposition and gratitude towards the one who spoke evil of you, regardless of his intentions, because without his reproach you perhaps would never have seen your vices. Console yourself even more with the thought of how our Lord endured everything with equanimity, and never justified Himself in any court. Double your efforts to conduct yourself as irreproachably as possible in all circumstances of your life. If the evil talk spread about you does not cease, or even multiplies, then resort to nothing but fervent prayer that the Lord God may have the kindness to enlighten and correct your slanderers. Act this way because Jesus Christ Himself acted this way even with his executioners. (Lk.23:34).